From 1999 to 2012 ThyssenKrupp Industrial Solutions, BU Resource Technologies (TKRT, formerly TKF) successfully supplied more than 18 high-capacity shiploaders for ships up to 200,000dwt and at 6,000/8,000tph (tonnes per hour) to the ports around Bohai Bay of Northern China, China’s most important coal terminals. This success story will be continued by the further award of four additional shiploaders which are proven to be the largest ones in size in China. In 2013, a milestone contract was awarded by China Huaneng Group to TKRT for the design, supply and installation of four 6,800tph shiploaders for coal, for its new coal terminal, Caofeidian No. 4 Coal Terminal. They are equipped with portal travel gears, boom with shuttle head and a loading device with trimming spoon, which allows for 360° slewing. With this option, it is possible to achieve the homogenous filling of the corresponding ship holds up to the uppermost edge, at a high nominal loading capacity. All of these machines are designed to load ships at a rated capacity of 6,000tph (maximum 6,800tph) and for Capesize ships and down to very small ships sizing to 15,000dwt. In order to save space on the jetty, a special design for the tripper car is adopted in the shiploaders. Each base machine is equipped with a luffing boom, shuttle head with pin rack and pin drives, loading spout and trimming chute. All mechanisms including for the belt conveyor are equipped with variable speed drives by means of frequency converter. To serve the different sizes of ships, a shuttle with rack and pinion drive, controlled by a frequency converter, is incorporated into the luffing boom, varying the outreach so that the shiploader can serve vessel sizes from small ships to a maximum Capesize ship. A modern drive control and PLC system is incorporated in the shiploaders; operation is mainly controlled via the computerized panel in the operator’s cabin. The high degree of automation and the visually assisted operator’s guide in Chinese allow the operating staff to operate the machines easily and in a comfortable fashion. For environmental protection, a dust suppression system using water spray is installed with a suction pump, water tank, spray pressure pump and spraying nozzles for all transfer points and the loading spout and cleaning compressed-air line. Special measures are also taken in the design to the transfer points and materials flow for a better and functional sealing of the chutes and skirting. In 2015, these giants will take shape and commissioning will take place, so that they can be put into commercial operation at the beginning of 2016. In 2011,ThyssenKrupp won the order for two bucketwheel reclaimers, one bridge type reclaimer, three stackers, one car dumper and one shiploader for the iron ore mine of Arcelor Mittal in Liberia. The new shiploader will be able to load iron ore at a rate of 10,000tph to ships with a maximum size of 90,000dwt. The shiploader is a classic coordinate type, with luffing and shuttling boom. A special feature is the rail track with one rail at the waterside but two rails at the landside. The wide rail gauge from the land- to the waterside of 30m normally would require a wide and heavy tripper car also running on this rail gauge for transferring the material from the ground-based pier conveyor to the shiploader’s boom conveyor. To gain weight and space, the landside is equipped with two rails at a distance of 7.5m, used as the runway for the tripper car. The shiploader itself is resting through a hinge point at the landside also on both rails and is therefore supported by in total three rails. To reduce erection and commissioning time at the site in Liberia, the shiploader will be delivered fully erected and pre-tested to the site. The new shiploader is nearly finished at the assembly yard in China and will be delivered by heavy-lift vessel to the site in Liberia soon. THYSSENKRUPP WILL DELIVER ONE OF THE WORLDWIDE BIGGEST SHIPLOADERS TO LKAB IN NARVIK/NORWAY ThyssenKrupp won the order for one of the biggest shiploaders in the world to be delivered to LKAB in Narvik/Norway. The new shiploader will be able to load iron ore at speeds of up to 11,000tph, to ships with a maximum size of 180,000dwt. ThyssenKrupp has already built shiploaders for higher capacities and bigger ships, but what makes the new shiploader for LKAB so unique and giant is the unusual design. The machine will be of a design used only on a very few shiploaders: it is a so called ‘linear shiploader’ similar to a radial or quadrant machine, but not using a circular curved but a short straight runway. Therefore the shiploader’s bridge is carried by non-powered travel gear at the pivot point to compensate for the bridge movement due to the non-constant radius. In addition to the compensating travel gear, the linear type needs a second pivot point above the travel gear of the straight runway and a roller table at the feeding point as the feeding point moves in relation to the shiploaders belt conveyor due to the compensation move of the bridge. ThyssenKrupp has used this unusual design due to the fact that LKAB operates already a linear shiploader built at the beginning of the 1970s. The reason for choosing this type of shiploader at that time was the limited space on site and the small amount of civil work needed on the pier due to the short straight runway. The new shiploader will be built in addition to the existing one on a new pier, but it is planned that a second new shiploader will replace the existing one at a later date. Therefore the design of the new shiploader has taken into account some of the specifications of the old one, by keeping the same distance between the runway and the pivot point as used on the existing one. Therefore a true copy of the new shiploader can be used in the future to replace the old one. The geometry and the design will make the new shiploader one of the biggest ever built. The total length of the machine with the upper carriage in its extended position is 152m while the maximum span of the bridge between straight rail track and pivot point totals 77m. The upper carriage itself allows for a shuttling way of 44m while the necessary compensating travel length of the bridge on the pivot point due to the straight runway totals 28m. The boom of the upper carriage has a length of 55m and is totally enclosed to ensure a maximum amount of environmental protection during the loading operation. Taking into consideration the polar environment at the site, the new shiploader will be delivered fully erected and pre-tested to Narvik to keep the erection time at site to a minimum. Due to the giant size, the high weight and the special design of the shiploader ThyssenKrupp had to develop a unique erection and shipping method in close co-operation with specialized shipping companies. Even for a company like ThyssenKrupp, which has vast experience in shiploaders, the new LKAB machine in Narvik is a big challenge and will mark another impressive milestone in the long history of shiploaders built by ThyssenKrupp. In Colombia, at the Port of Brisa, Bedeschi has completed the supply of more than 3km of conveyers and a shiploader with a loading capacity of 6,000 tonnes per hour. The travelling, slewing and luffing shiploader is equipped with a curved chute to enable complete distribution of cargo inside the holds of vessels so as to avoid broken space. Vessels up to 180,000dwt can be loaded at this port. The multi-purpose terminal of Brisa will primarily handle coal, but will also be able to handle other dry bulk cargo too. This port is at an advanced stage of commissioning and trial operations. Bedeschi relies on Logmarin Advisors for the logistics optimization of its terminal facilities, supervision and assistance during commissioning, which already started for the South American terminal. material handling, especially in port terminals, heavy duty and long distance conveyors. The company has a large portfolio of different shiploader designs, including a complete turnkey travelling unit with the feeding belt supplied to AGP in the Port of Grays Harbor – WA, USA. The TMSA shiploader product line includes more than seven types of ship and barge loaders with over 70 units supplied and a further eight units under current open contracts: one system with three fixed towers for Vale in Argentina and five travelling slewing type for different ports in Brazil. High handling rates and larger carriers place new demands on equipment manufacturers for more efficient, larger and heavier handling systems. Larger bulk carriers have posed problems in connection with the length of over-ship booms to the entrance and interior of the ship’s holds. The design of ship’s hatches varies considerably and this can place strong constraints upon the average handling rates. In addition, large vessels may stand high above the edge of the quayside and this can make loading and unloading operations difficult. Because of the stress distribution in a ship’s hull, and for other structural reasons, it is not generally permitted to completely load one hold in one operation; a phased work schedule is required. During the various phases, the loading or unloading element has to be moved from hold to hold, without causing damage to the vessel or the equipment. the movements of the ship must get priority when designing a loading/unloading system — it must be assumed that a ship has a mass and that her movements cannot be stopped by any equipment. storm anchor — it is recommended to have the shiploader structurally anchored to the quay. The optimum type, cost and effectiveness of auxiliary equipment for feeding, cleaning and trimming make the ideal loader. In addition, loading must be closely co-ordinated with the feeding conveying, storage and silo load out systems of the port terminal. In order to cover this wide range of requirements,TMSA conceived different shiploader designs, with retractable or telescopic spouting and with the possibility to fit, at the lower end of the spout, a trimmer for spreading the material in the ship’s hold or a dust free loading device. the shuttle horizontal boom conveyor with its vertically hanging loading chute. Loading gantries can be fixed or mobile; each loading system has its own merits and must be considered case by case. Shiploading berths are expensive and complex. They involve the integration of a conveyor system, loading structures and supporting infrastructure. Shiploaders can affect the design and cost of the infrastructure and vice versa. Loading port terminals with piers are typically equipped with mobile shiploaders and terminals without piers are provided usually with stationary fixed loading towers. These are made of steel or concrete, with different types of boom, which can be slewed, shuttled, lifted and lowered. They are an efficient and cost-effective solution. Ship hatches can be loaded individually or simultaneously by several loading lines. Travelling shiploaders comprise the main portal frame, an articulated boom with a moveable head conveyor, travelling bogies and a Cleveland Cascade-type telescopic loading spout. Travelling systems normally travel at 15 to 20m/min (maximum 27m/s), using 32 wheels driven by motor reducer units with electromagnetic brake and speed control by frequency inverter. With all types, blocking sensors stop the loader in case of proximity to another loader or obstacle. A set of electrical drives with PLC and exclusive supervisory system is provided with safety devices for product conveying, loading cells for overloads control of steel cables, sensors, emergency brakes and other standard devices. This has a boom belt shuttle conveyor with a boom hoisting system with a lifting angle from 0o to 75o with a hoisting drive with steel cable winch. It is structurally fixed at 75° to support out of service winds. In the slewing-type loader, the boom stays horizontal, parallel to the quay. The Cosan and the Copersucar shiploaders in Santos, Brazil, both have a loading capacity of 3,000tph for bulk sugar. The combination of movements makes it possible to reach all points of vessel’s hatches. TMSA searches for the best and most economical solutions, based on its long and rich experience as a shiploader specialist. All solutions must meet the client’s requirements in terms of performance and reliability, weighed against , not only the capital cost , but also the operation costs of the project. A selected shiploader design has the ability to reach all points in the holds of a wide range of vessels. The pollution of the environment is a critical topic with many dock sites situated close to residential areas and stringent health laws and regulations being applied for the dust control and the reduction of noise levels. High efficiency circulator fans, cyclones and compact filters handle the dust generated during shiploading. TMSA has developed a system for dust suppression and trimming (combined): the ‘Dust Trap’ which can be adapted to existing shiploaders. TMSA also supplies conventional designs, such as telescopic Cleveland Cascade loading chutes or the new DSH Dust Suppression Hopper from New Zealand. It has already installed in existing shiploaders, with great success, a DSH for loading 1,500tph in Santos Port, Brazil, and is expecting new orders for 2,000tph and 3,000tph units. Absam, France. Surface truck unloading unit and the Manutube, an enclosed belt conveyor with a belt sliding inside a plastic tube with no idlers, fully enclosed. VIGAN, Belgium, for pneumatic ship-unloading. Telestack, Ireland, for mobile telescopic shiploaders. Ravestein, the Netherlands, a shipyard and construction company, specialized in building bridges, modular loading quays as well as design and construction of crane and shiploader pontoons which substitute the conventional concrete pier avoiding long term civil works. TMSA, offers different solutions for the conveying of bulk material to the shiploaders. It has supplied belt conveyors with capacities up to 20,000tph and shiploaders for sugar, iron ore, coal, alumina, kaolin, grains and other heavy duty commodities ranging up to 4,000tph. The company’s wide technological portfolio offers belt conveyors that can be open, covered or enclosed, such as the RopeCon system, pipe conveyors, overland conveyors or conventional trough conveyor belts with high capacities. TMSA has the knowledge and experience for the proper selection of a shiploader and conveying system which will fit the needs and budget of each project. Many shiploading or unloading ports are faced with problems such as congestion, no land for expansion, and costly outdated infrastructure. Ports confronted with these problems must search for new and creative solutions to handle them. An ideal solution is to move bulk handling operations — including shiploading — to the water, with barge mounted E-Cranes. An E-Crane distinguishes itself by being a fully balanced heavy duty crane. The E-Crane design is based on an ingenious parallelogram style boom that provides a direct mechanical connection between the counterweight and the load. This unique four-bar mechanism system ensures that the E-Crane remains in near perfect balance throughout its working range. This unique feature results in an important economic advantage as an E-Crane requires approximately 50% less power consumption compared to competitive cranes, whose counterweights are fixed or only linked to the boom and not the load. Along with the significant energy savings that a balanced design provides, it makes the E-Crane ideal for mounting on a floating barge. Because the crane is balanced, the movement of the E-Crane causes very minimal listing and movement of the barge. A barge-mounted crane is also beneficial because it floats up and down along with the material barges and ships when the water elevation changes. This means that the cycle of picking material out of the barge or loading ships is never affected by water fluctuation. The operator never has to adjust to this fluctuation and no cycle time is added compensating for varying water levels. Additionally, an E-Crane being installed on a barge or pontoon can be built and tested locally and then floated to its final destination. This eliminates costs and difficulties of local logistics and marine construction. Also, a floating terminal can be moved and located at the closest point suitable for the end user, optimizing the set-up, making bulk handling faster and more efficient. The complete terminal can also be relocated quickly and cost effectively if required, because of the modular concept. The E-Crane is designed specifically for barge- and shiploading and unloading, and is a proven and trusted solution in many bulk material handling industries. Most dedicated systems for offloading coal, limestone and other bulk materials are costly, inflexible, and require an expensive, hard to maintain infrastructure. E-Crane’s versatility, reliability and flexibility allows for tailor-made material handling solutions. These custom solutions, combined with E-Crane’s modular design, make E-Crane the ideal equipment for any bulk handling application. The standard E-Crane product line consists of five series of balanced hydraulic cranes (E-Cranes): 700 Series, 1000 Series, 1500 Series, 2000 Series, and 3000 Series. The E-Crane is placed firmly between production line excavators (or material handlers) and large scale dedicated unloading structures. Even the smallest E-Crane offers much more unloading capacity than the standard excavator, while the larger E-Cranes compete with dedication systems in terms of production but come in at only a fraction of the installed cost with even less annual maintenance costs. The E-Crane series offers models with up to 50 tonnes duty cycle capacity and outreaches of up to 150ft (50m). E-Crane Worldwide is a modern, state-of-the-art engineering and heavy equipment construction company, based in Adegem, Belgium and with subsidiary companies for sales management, technical support and service in The Netherlands (E-Crane International Europe) and Ohio, USA (E-Crane International USA). E-Crane Worldwide develops turnkey material handling solutions with engineering services, equipment manufacturing, erection, operator/maintenance training and custom tailored on- going service programmes for its clients. DF, the Spanish industrial group, has been a public listed company on the Madrid Stock Market since 1905. Since it was founded, the company has been continuously evolving to adapt to market changes and increasing requirements on its projects with faster delivery times and higher performance. The company’s engineering department is based at its headquarters in the north of Spain, which facilitates the development and design of the material handling machines and conveyors for all projects. In recent years the company has been focused on the international market; taking advantage of its worldwide presence, it has maintained its competitive level of prices without compromising quality. Three new subsidiaries have been opened recently in key areas in the world to take care of new markets: the Middle East, Indonesia and Australia. PT Duro Felguera Indonesia is a licensed Mining Services Company in Indonesia, to supply material handling solutions for mining companies on a turnkey basis. It also assists DF projects in other countries by sourcing commercial supplies in Indonesia for material handling projects. DF Mining & Handling is specialized in project development on an EPC basis, in areas such as bulk material handling, mining and mineral processing. DF M&H carries out the complete process to develop a project: engineering, procurement, manufacture, erection, commissioning, operation and maintenance. Coal and coke shiploader for Kinder Morgan Terminals, USA This is DF’s latest commissioned machine, in May 2014, and the second shiploader DF has successfully installed in the USA. This state-of-the-art loader was designed at DF’s headquarters in Gijon and manufactured and assembled in China, with all commercial items supplied from Europe. It is a travelling, luffing and slewing shiploader equipped with a shuttle boom, boasting a nominal rated capacity of 5,000stph (short tonnes per hour) of coal and also designed for coke. The machine is designed to be capable of loading bulk carriers ranging in size from 40,000dwt to 118,000dwt. It has the latest dust suppression system design to comply with environmental regulations. The final destination of the shiploader is Kinder Morgan’s existing Deepwater Terminal at Pasadena, Texas. Due to the fast track delivery time, the machine was fully assembled and tested in the workshop and transported on large pieces to minimize the down time of the existing terminal in Texas. Jambi Province is one of the coal mining areas on the Indonesian Island of Sumatra. Coal from mines located in remote areas is transported by truck to the main port in the city to load ocean barges to send the coal to the mother vessel. In January 2014 the regulations concerning coal transportation by truck in this province established that truck coal transportation is no longer permitted, in order to reduce the damage caused to roads by the continuous queues of trucks. PT Bara Ria Sukses has contracted PT Duro Felguera Indonesia to develop the Jambi Coal Terminal on an EPC basis at the limits of the area where coal transportation by road is no longer allowed, roughly 80km up the Batanghari River. 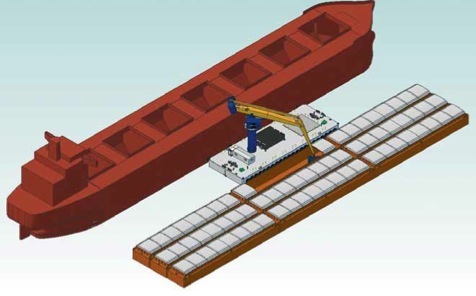 The complete terminal is designed to receive and stock coal from different clients, before loading it onto the barges that then transport the coal to the vessel at the anchor point in the ocean. loading hoppers with variable-speed belt feeders; and v	complete civil works including the marine jetties. Jambi coal is very soft with low calorific properties, and due to the logistics in the area it was necessary to design a system capable of loading large pieces of coal in order to minimize degradation.